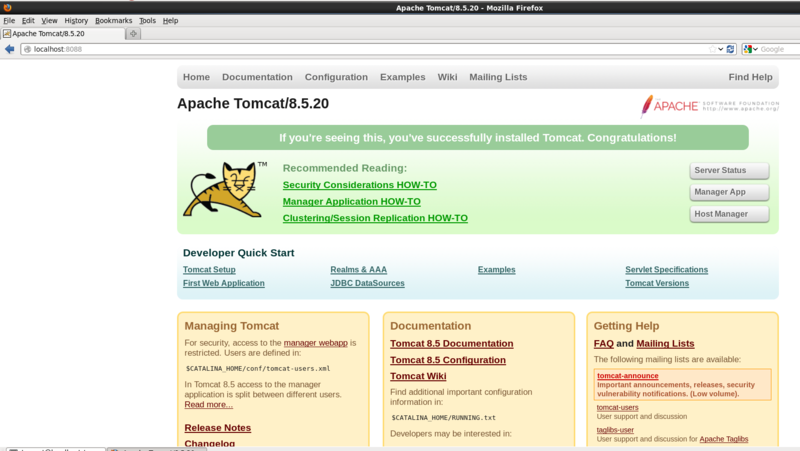 In this post we will learn how to install tomcat on unix machine.Being the latest tomcat version, i will be install apache-tomcat-8.5.20.tar version. Before we begin, make sure that your Java runtimes are up to date, and that you are running a version of Java high enough for the Tomcat distribution you are preparing to install. If you do have java installed , install the latest version or the version that you think suitable for you. Make sure you download it depending on your system architecture i.e for 32-bit OS or 64-bit OS. After downloading java from the link provided above , you can start its installation. After downloading .tar file we are ready to install tomcat on our machine. I have downloaded it in /webserver/bin directory of my server. NOTE: You don’t want to run tomcat as root because it introduces the unnecessary risk that a compromised tomcat instance could yield control over your entire server also you usually don’t give root permission to application users. Ergo, creating a user with low privileges to run tomcat should be standard practice when installing new instances.Adding and switching to tomcat user. Here -xf option for extracting all files from archive, -v option is for verbose which verbosely list files processed. After installation , run tomcat by the scripts provided (or you can create your own) in the bin folder $CATALINA_HOME/bin/startup.sh . To make sure that the tomcat instance ran without any hassle , see logs. In my case i got the port bind exception. NOTE : The default port for tomcat is 8080.
change the port number to something else in server.xml file that you can find inside conf folder of tomcat. Restart tomcate after doing change. Open browser and enter the ip or domain name of you server with port to see default tomcat page. By default the port is 8080 but i have changed the port so i will beusing the port number 8088. The page that you can see below is inside CATALINA_HOME/webapps/ROOT folder in my case it is /webserver/tomcat-A/apache-tomcat-8.5.20/webapps/ROOT. We need to do some configuration before we could use this page. I have discussed it in STEP 4.
here $CATALINA_HOME is tomcat home directory.In my case it is /webserver/tomcat-A/apache-tomcat-8.5.20. Similarly, you can also add ‘admin-gui‘ role to a admin user named “admin” with a password “yourpassword” as shown below. Restart tomcat so that it could pick the changes we have done. Now everthing is done except the application deployment for which you have configured the tomcat.Incase you are doing a redeployment, delete the existing deployment from the “$CATALINA_HOME/webapps” directory. Place the “sample.war” file in the “$CATALINA_HOME/webapps” directory and Tomcat with automatically deploy it. You will see a “sample” directory appear.